I can’t think of a better way to conclude Jewish American Heritage Month than with this delicious braided bread, which has become so mainstream in American culture. Challah can be found in gourmet bakeries and everyday supermarkets, as a mystery ingredient on Food Network’s Chopped, and if you are lucky, straight out of the oven. 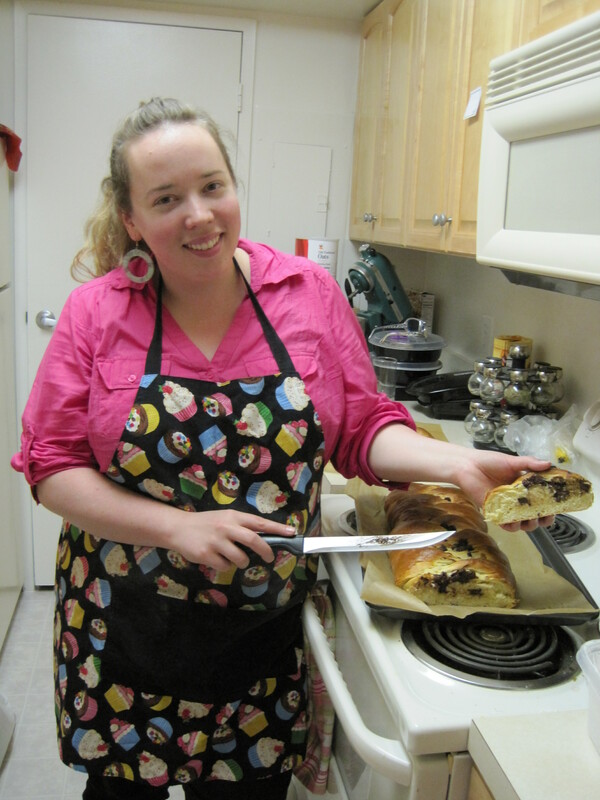 Challah has ancient roots, and is even mentioned in the sacred Jewish book, the Torah. The earliest challah likely resembled flat pita bread. During the times of the Temple in Jerusalem, a portion was reserved for the priests. In fact, the biblical Hebrew word “challah” translated to “portion” and referred to this offering made every Sabbath. Some Jews continue this tradition today by burning or throwing away a small portion of the challah dough prior to baking. Virtually every Jewish community across the globe carried on this tradition with their own variation. In South Africa, where many Jews are of Lithuanian descent, the bread is called kitke. The braided challah that we think of today originated in 15th century Europe, where German Jews replaced their rectangular loaves for round braided loaves similar to those baked by their non-Jewish neighbors. 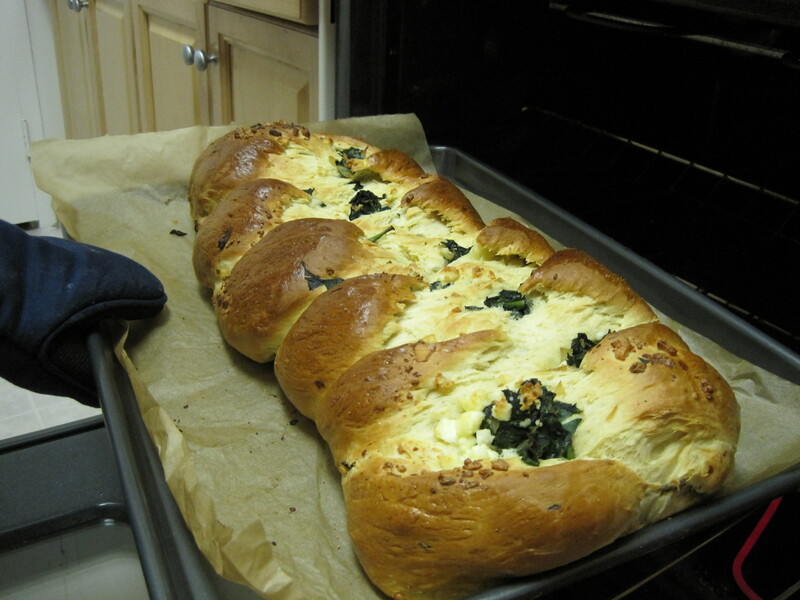 The trend spread, and centuries later the braided egg bread arrived in America through Jewish Eastern European immigrants. 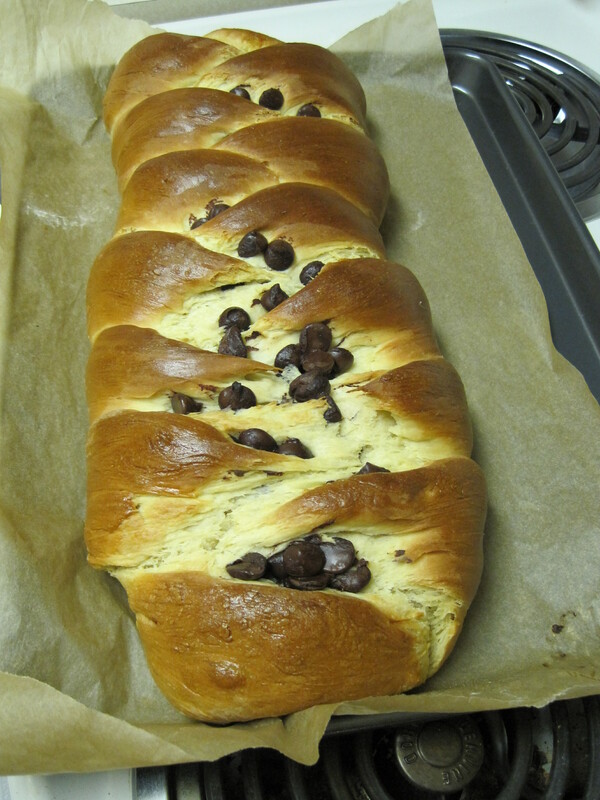 The chocolate chips made the bread truly cake-like. 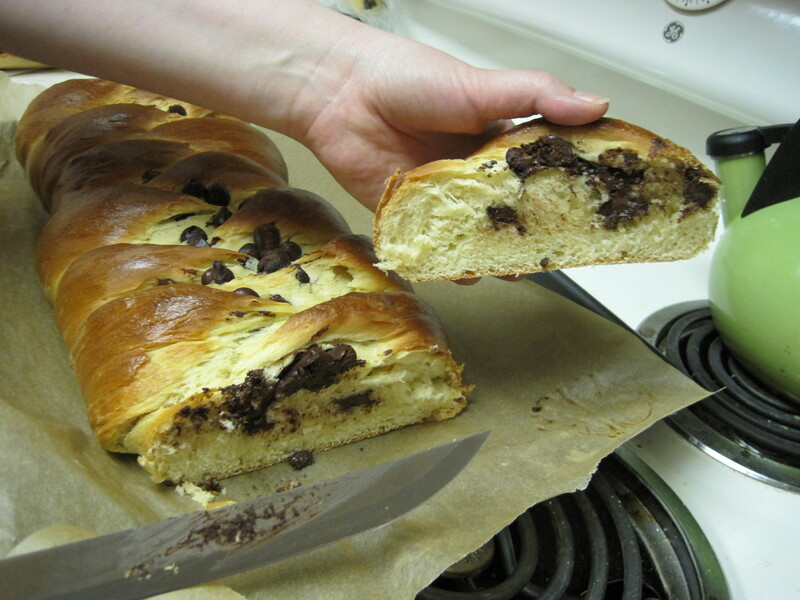 Yes, today challah bread is known for its sweet, often cake-like composition. Yet sugar was not added to traditional challah dough until the bread’s debut in America. In the 19th and early 20th centuries, sugar was considered a sign of affluence, and was added to most American breads, including challah. Another American twist! Nathan, Joan. In The Oxford Companion to American Food and Drink, ed. Andrew Smith, 331. New York: Oxford University Press, 2007. While many challot (plural form of challah in Hebrew) are sweet and often flavored with orange zest, cinnamon, raisons, they don’t have to be. We like to push the envelope a bit, so today’s recipe includes both sweet and savory variations. The recipes are almost the same, with a few modifications. Yes, it is as tasty as it looks. 1) In a large bowl, add yeast to warm water. Add sugar and 1-2 cups flour and allow to sit for 30 minutes. 2) Add salt, oil, and eggs. Gradually add remaining flour, one cup at a time. If you add all at once, good luck to you! This dough gets tough fast. If you have KitchenAid with a dough hook, this would be a good time to use it. Hilary and I decided to work our muscles and give Minerva the Mixer a break this time around though. 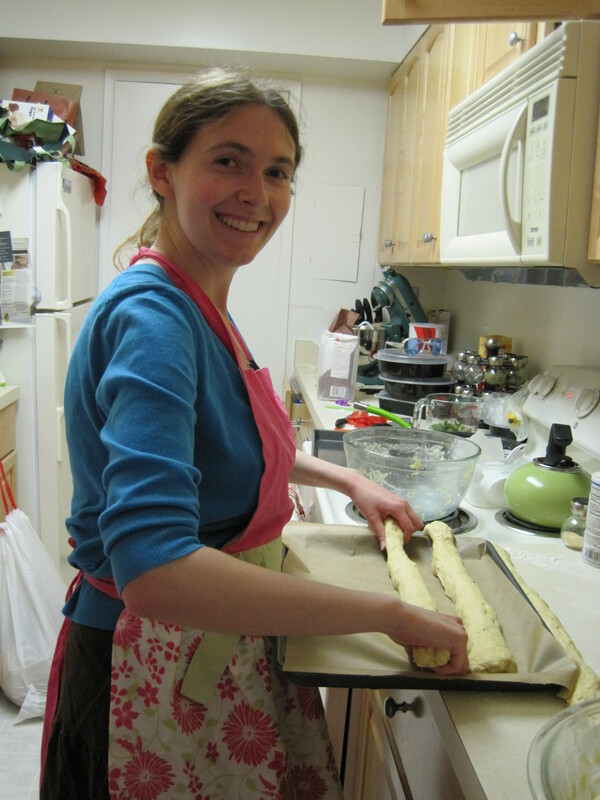 Kneading the dough with Hilary! 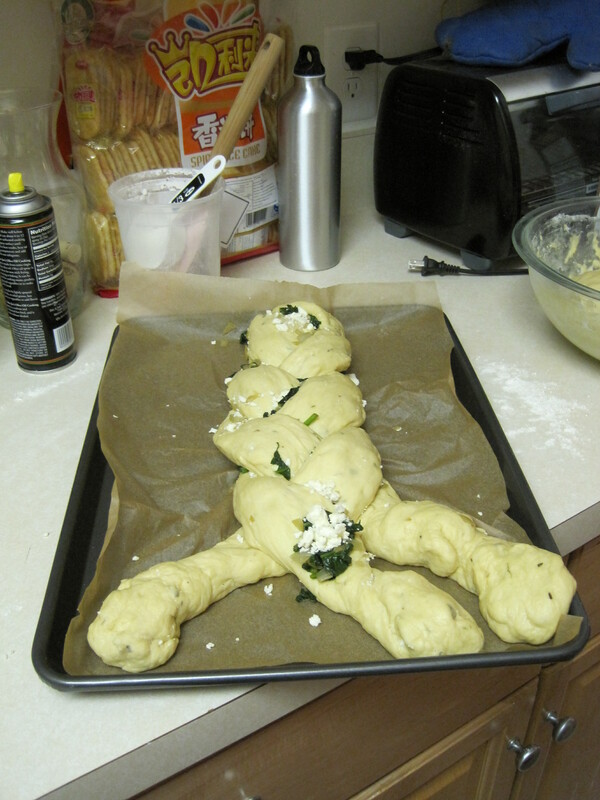 3) Leave dough alone in a warm place (I use the oven) for 1 ½ hours. It will be fine, promise! 4) While your dough is resting, sauté the onions on medium heat in a skillet with the tablespoon of oil. Once onions are translucent and brown, add the chopped spinach until wilted. Cook until excess liquid disappears and let cool. 5) Ok time to go back to the dough you abandoned. Knead the dough on a floured surface for 5 minutes. 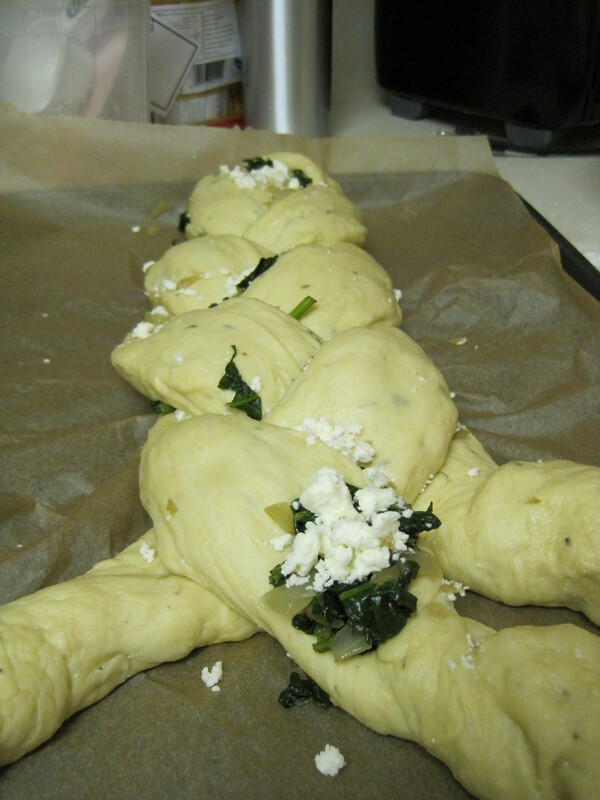 *You could mix the spinach, onion, and feta mixture or chocolate chips into the dough at this point, or reserve for braiding process. We opted for the latter. I’m having way too much fun. 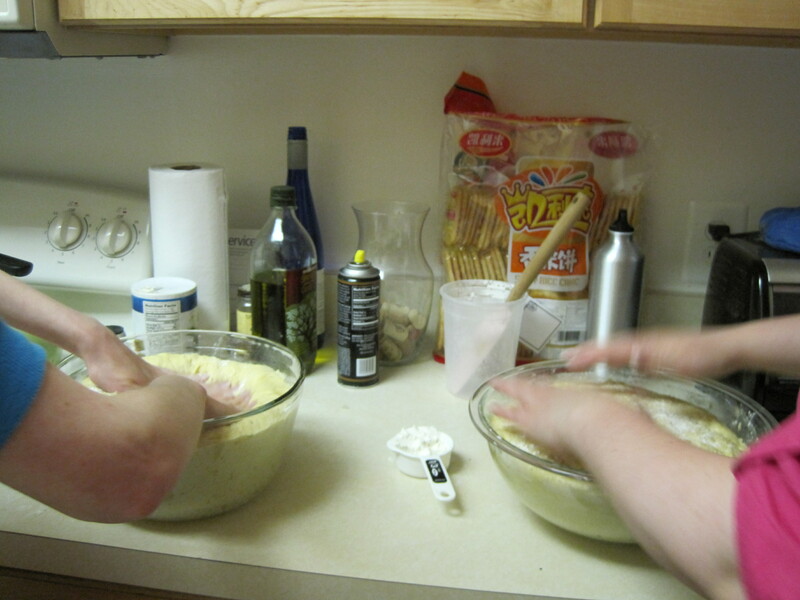 6) Divide the dough into three even balls. Roll each ball into a long strand. Place on a parchment paper-lined baking sheet. 7) Pinch the tops of the three strands together. 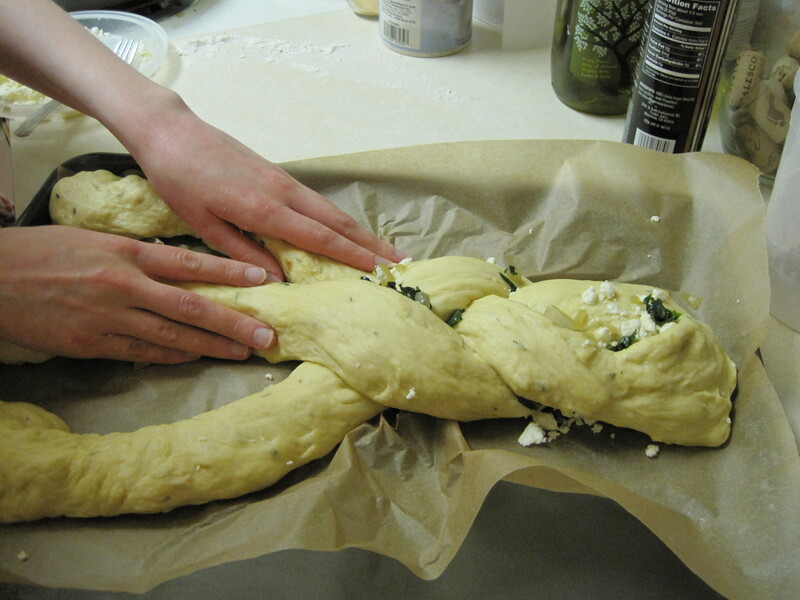 Begin to braid the bread, starting by moving the left strand toward the center, then the right towards the center, and repeat. 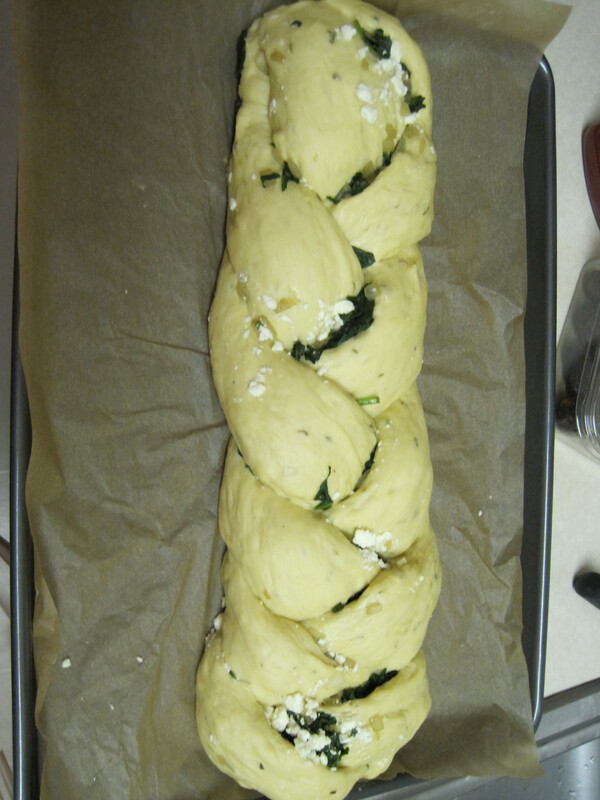 As you do so, stuff the spinach mixture or chocolate chips under the braids. 8) End by pinching the three strands together. Allow the loaf to sit for another 30 minutes. 9) Beat egg and brush on top of the loaf. Bake in a 350 degree oven for 30 minues or until golden brown. 10) Enjoy! 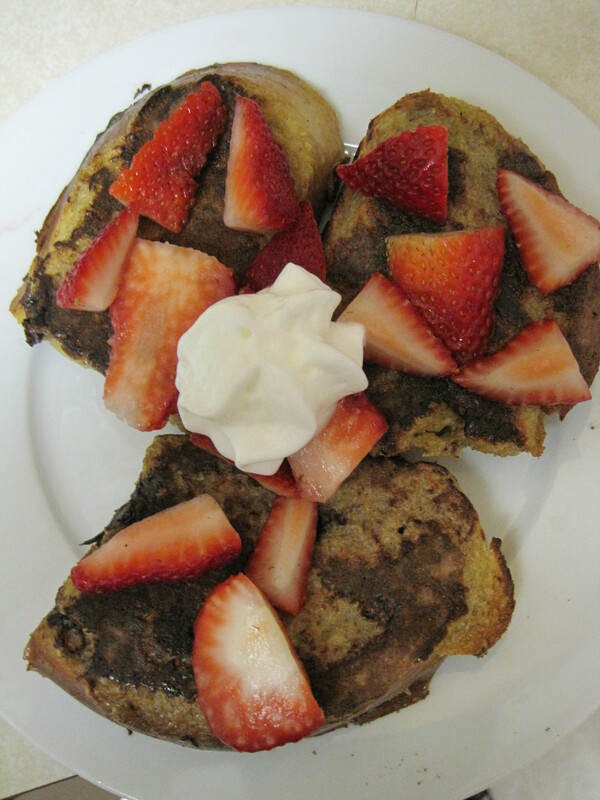 Both versions make great French toast. Extra challah? Might I suggest French toast? 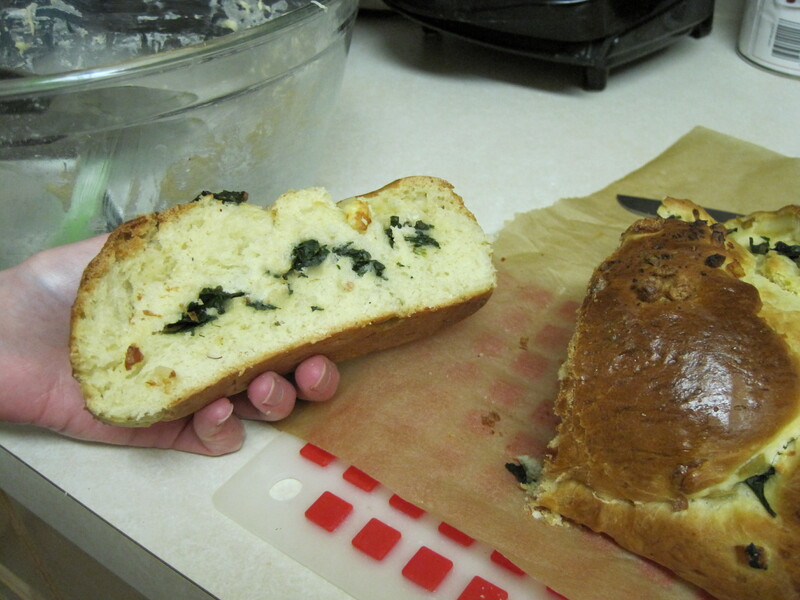 The chocolate chip challah also makes a great bread pudding and the spinach challah is delicious with fresh tomato and basil. Thank you Hilary! P.S. isn’t her cupcake apron wonderful? I want one! This entry was posted in Uncategorized and tagged bread, breakfast, cheese, chocolate, Jewish recipes, spinach. Bookmark the permalink.